Slingshot Sponsorship wins SME News’ most innovative sponsorship agency award for 2018. London, UK, 27/11/18 – Slingshot Sponsorship, a strategic sponsorship agency, has today been named 2018’s most innovative sponsorship agency by SME News as part of their Business Elite Programme. SME News (a brand of AI Global Media) is a quarterly publication which draws on a UK wide network of industry insiders to provide CEO’s, leaders and decision makers with cutting edge features, the latest news and industry deals. To see the full list of winners, click here. Slingshot Sponsorship is an innovative strategic sponsorship agency based in Central London with offices around the world. Slingshot works across all industry sectors to help organisations identify, create and optimise assets so they become engaging marketing opportunities for brands to partner with. Clients include diverse verticals such as publishing, events, music artist rights, award programmes, music festivals, business conferences, sports teams and charities – all with a desire of pushing the boundaries in traditional sponsorship. In our previous blog, we outlined the importance of prospecting and having a tailored approach to every brand that could be a potential sponsor: now it’s time to approach these brands. The initial call is a fundamental aspect of the sales process, as the old saying goes: first impressions mean everything. Below are Slingshots top tips for making sponsorship sales calls and creating a stand out impression for your opportunity. Use your hooks from prospecting: A solid prospect list will be a goldmine of reasons why a brand would make the perfect sponsor, the challenge now is to translate this to the person on the other end of the phone. Relating the approach back to the key reasons why a brand would sponsor enables you to demonstrate the areas of business your property will add value to and keeps the call clear and direct. Sponsorship isn’t a fundraising request, it’s a bonafide, tried and tested marketing tool that adds value to their business and the call should deliver that to the prospect a concise way. Effective questioning: As a sales professional, there’s nothing worse than thinking you’ve got a really hot lead only to find out later on that that your lead is a non-starter. To avoid this episode, it is crucial to ask the right qualifying questions (if you generate initial interest on the call) as early on in the process as possible: “Are you the sole decision-maker on sponsorship opportunities for the brand?”, “When do budgets generally get allocated for the brand?”, “Are you in talks regarding any other sponsorship opportunities currently” All are inoffensive questions that will qualify your lead and save wasting time on dead ends. The follow up: If the brand is interested, it is vital to set up a follow up call. Sponsorship has a long lead time sometimes up to 3 years before the event, and without a real sense of urgency brands can be lacklustre to respond. Therefore, it’s the sales person’s job to create that urgency. By arranging the follow up call it puts a lose deadline for internal meetings and discussions on the brand side and hopefully keeps your proposal near the top of the pile. “It’s a no from me”: It happens, we all get rejected. But, the important thing to remember is to try to keep the conversation alive. By asking a few “why not’s” here and there, a good salesperson will divulge information about the brands marketing objectives. Armed with new information, a counter-argument can be formed with assets that will help achieve these goals and ease their doubts. Additionally, it aids prospecting for future opportunities: brands can be pre-qualified based on previous conversations. By sticking to research and depicting the opportunity correctly, an approach can be made that not only demonstrates the potential of the opportunity, but also protects relationships with brands. By having a genuine set of reasons for a call, a line of communication is opened that will keep ears open for future opportunities. Without proper justification for a call, sales people risk irritating the receiver, damaging personal reputation and severing any opportunity for future conversation. If you are looking for advice on sponsorship sales or any aspect of the sponsorship industry, we would be more than happy to offer our expertise, please email info@slingshotsponsorship.com with any enquiries. All too often, people in the sponsorship industry dive into sales headstrong, without proper justification behind each of their approaches. This leads to poor performance and a lack of interest from prospects and can be avoided simply by taking the time to identify fit. The role of a sponsorship sales professional is to prove value through sponsorship to the brand they are approaching. It is crucial that before starting to sell sponsorship, key research is undertaken and brands are targeted which align closely to the specific assets, and have the best fit with the specific demographic. Below are Slingshot’s top three tips when prospecting brands. Visualise the audience experience: The first step before doing anything is to brainstorm the experience an attendee will get and to then understand how a brand would want to engage. This paints a picture as to which industries and brands would benefit the most from sponsoring and which might improve the experience for attendees. Zeroing in on targets: Armed with an idea of what industries to consider, build a prospect list based on the synergies between specific brands and the demographic. The main point of sponsorship is to enable a brand to access an audience they couldn’t target otherwise, or to showcase that by engaging in sponsorship they can do this in a cost-effective way. It is important to consider what new products and services a brand is offering and how these can be integrated. What’s the hook. With a solid prospect list in hand, outlining a tailored approach for each prospective client based on their current marketing objectives is essential before picking up the phone. A good tip is to think of 3 key points as to why the brand in question should become a sponsor. Pair the brands objectives with specific assets and use these assets to showcase how they solve a brands problem. For example; a consumer electronic brand is trying to increase it’s B2B capabilities and engage more with senior-decision makers in large organisations. The rights holder has a database (GDPR compliant of course…) of decision makers that would be the perfect potential clients of this brand, therefore the sales pitch becomes about utilising this database to engage and create new leads for the brand – something they couldn’t do without sponsorship. It is essential to perform this research before diving in to sponsorship sales. It will ensure that the rights holder will understand what the sell is to each brand, and can therefor tailor their approach, solving a problem and not just asking for money. At Slingshot we pride ourselves on the fact that each call is tailored for that brand in order to add real value to their marketing spend, and satisfy their marketing objectives. It is this highly tailored and specific sales strategy which has led to our impressive roster of clients, and testimonials which praise our “attention to detail”. Charity partnerships have shown they can be extremely effective when done right; you only have to look at partnerships between LEGO and WFF, Pampers and Unicef and the I am Shaquem Griffin video, which shook the internet to see this. But for many years, there has seemed to be a reluctance to maximise charity sponsorships. In the digital age, modern high-level sponsorships have formed a crucial component of the strategic marketing mix, but it could be argued that CSR focussed sponsorships have seemingly been behind the curve. Although in recent times there has been a noticeable shift in CSR sponsorships, Slingshot believes that more can be done so that brands and charities can harness each other for a greater mutual gain. Charities have the potential to offer brands so much more than CSR alone. In many cases, charities can offer everything that a normal rights holder can: brand awareness, experiential opportunities, direct sales, digital marketing and access to high-profile ambassadors. On top of this, CSR partnerships offer great client hospitality opportunities, and are generally linked to internal stakeholder and employee satisfaction. However, for more charities and brands to take advantage of these benefits, attitudes to these types of partnerships need to change. Firstly, the charities themselves need to realise their commercial potential. Historically, charities have fallen into the trap of leading with a philanthropic pitch when in-front of brands rather than showcasing the value of a sponsorship deal. Charities are so unique and varied that they have assets and activation opportunities that many properties cannot offer, so charities must invest in the understanding of their audience, realising their USP and harnessing this for their commercial benefit. Additionally, we stress that charities need to be proactive! To get sponsors, you can’t wait for the proposals to come to you, you need to make them yourselves. Attitudes of brands need to adjust too. There’s generally a timid behaviour towards charities: ‘we have to do this for goodwill, but we can’t use this as a commercial opportunity’… Of course, you can! Charities want to work with relevant brands to create value for their audience just like a music festival or sports team does. Being actively involved in a sponsorship that has a strong fit with your demographic will create value for the charities consumers and help your brand reach a more holistic set of objectives. This will lead to a more authentic long-term relationship, which will be far more effective than simply donating to a goodwill cause. Slingshot can help with any enquiries about sponsorship. If taking your sponsorship strategy seriously is of interest to you, please don’t hesitate to get in touch! English football team Chelsea and global sportswear brand Adidas outline the potential challenges that long termed partnerships can create. In early May this year, a mutual agreement was made to end the sponsorship deal that short-fell Adidas’ potential and failed to reflect the value of Chelsea FC. The 10-year sponsorship deal ended after only four year on the basis that the partnership was not benefiting either party. Chelsea felt the £300million deal did not reflect their success nor their value, whilst Adidas felt the deal was not in line with their new business strategy of maintaining a lesser number of sponsorships at an increased sponsorship sum for their sponsees. Having recently made a £750million sponsorship deal with rival team Manchester United, Adidas left Chelsea FC feeling undervalued and believing they could achieve greater sponsorship than what had been offered to them 4 years ago. On the other end, with Chelsea’s shocking performance this past season, there was no incentive for Adidas to increase the amount of the sponsorship deal in a way that offered enough benefit and still aligned with their new strategy. Whilst the partnership proved to be mutually beneficial for the initial years, in recent times with both parties growing and evolving it only proved to be a hindrance to their futures. With the sponsorship industry constantly growing and as a result its costs ballooning, Adidas prioritising their new strategy of a more focused portfolio. Additionally, Chelsea’s acknowledgement that their partnership did not reflect their market worth today was vital in their growth with a new partner. The sponsorship industry evolves at a rapid rate, shifting away from logo badging to strategic business deliverables. Simultaneously the sporting world, and more specifically the football industry remains somewhat volatile – with politics and the economy affecting players and transfers amplified by team performance (Leicester City). Although signing a 10-year contract may seem beneficial, the pace of the industry and media landscape evolution creates more risk. Long termed contracts in such changing conditions mean that partnerships can get to a stagnant point where neither party can maximise the initial benefits sought. The idea that an extensive contract will provide security is predominantly only viable when looking at the monetary side of sponsorship, but sponsorship is more than money. This façade of security tends to be a contradictory ‘benefit’ – potentially being more risky than short term contracts that evolve as both partners evolve. Far too many of our new business meetings focus purely on who Slingshot knows at Board level with brands. Undeniably, we know a lot. But that’s our business – it’d be like if McDonalds didn’t know what types of condiments to use for their hamburgers. It would be ludicrous if after 6 years of selling sponsorship rights to global brands, we didn’t make a friend or two along the way. Unfortunately, almost all sponsorship sales agencies use this angle in their pitches – providing a false sense of security, to the potential new client, that sponsorship sales is all about speaking to the right person. This couldn’t be farther from the truth. In my 15 years of selling “stuff”, it’s almost never about who you know. Bad salespeople focus on this in a new business pitch because it’s easy. Rather than take time to review the boring strategic processes that underlie sponsorship sales, it’s easier to provide wow factor by name dropping. This masks the fact that the challenge of selling sponsorship actually is controllable by a rights holder and can be fixed without hiring a specialist sponsorship sales agency, and no one really wants that do they? Slingshot’s approach is never about the black book, which many think is unconventional and also means we lose a lot of pitches to those that guarantee sponsors and often unachievable revenue targets. The smoke and mirrors sales pitch champion who they know, but if you are struggling to maximise your full sponsorship potential it’s not because of your sales people, your property or your access to LinkedIn – it’s your commercial strategy. Without a commercial strategy that understands what assets you have, what assets brands require to drive ROI, your fair market value and a pretty spectacular proposal – you honestly don’t really have a chance. I am pretty good friends with a lot of big brand buyers, but even I can’t flog something without the above. Gone are Chairman’s Whim days, but it means you have got to start thinking about your proposition if you are going to invest time and resource into selling sponsorship. Rockstar Energy Drink has been announced as the ‘Offical Energy Drink’ for Snowboxx Festival 2016 with the agreement brokered by Slingshot Sponsorship. Snowboxx Festival has found a new home in Avoriaz, the heart of the Port du Soleil ski region. The festival is creating something never before seen at winter festivals, its own ‘Snowboxx Village’ in the heart of the town. The village will host a plethora of events, main stage performances, off-the-wall festival features & local food and drink stalls. The partnership will see Rockstar Energy Drink integrate throughout Snowboxx 2016 having been granted use of use of a range of Snowboxx imagery and assets. This will be further supported by VIP competitions to offer attendees the opportunity to experience Snowboxx 2016 as a true Rockstar. Following sell out attendances in the last three events, Snowboxx 2015 featured the likes of Jungle, 2manydjs, Blonde and Eton Messy for a week of music and slopeside activities. Now Snowboxx 2016 is set for an even bigger 2016 lineup with chart topping duo Sigma and double Mobo award winner Stormzy already featured on the bill alongside hip-hop legend Grandmaster Flash. Aden Levin, Managing Director, Snowboxx remarked “The partnership with Rockstar Energy Drink is really exciting for Snowboxx. The brand embodies the Snowboxx spirit of living life to the full and there is a great crossover between the event attendees and their audience. We look forward to welcoming them to Avoriaz!“. Brand ambassadors have long been used by brands, however it is the return of a larger than life King that has drawn attention across the globe in recent months. Once over shadowed by the might of McDonalds’ Ronald McDonald character (named after former CEO and inventor of the wildly loved chicken nugget) the Burger King, King has returned! Distinctive and instantly recognisable, standing at over 6 feet tall ‘The King’ has been sighted at various high profile events this summer including the 147th Belmont Stakes where he appeared with Triple Crown winning trainer Bob Bafferrt. The King’s resurrection began at the start of the summer forming part of the entourage which escorted Floyd Mayweather to the ring during the ‘fight of the century’ against Manny Pacquiao in May this year. Due to the furor of offenses and negative publicity following Floyd Mayweather in recent years, brands have been cautious to not align with the star; however reports have sited that Burger King purchased the rights for $1 million, becoming one of Mayweather’s first sponsors for some years (having topped the Sport Illustrated Fortune 50 athletes with $0 endorsement deals three times). The mere sight of the brand ambassador in this setting created mass attention around Burger King. Social media interaction increased significantly creating over 1,343% growth interest for the brand. Yet not all interest was positive with many criticising Burger King for supporting the convicted domestic abuser across Twitter. 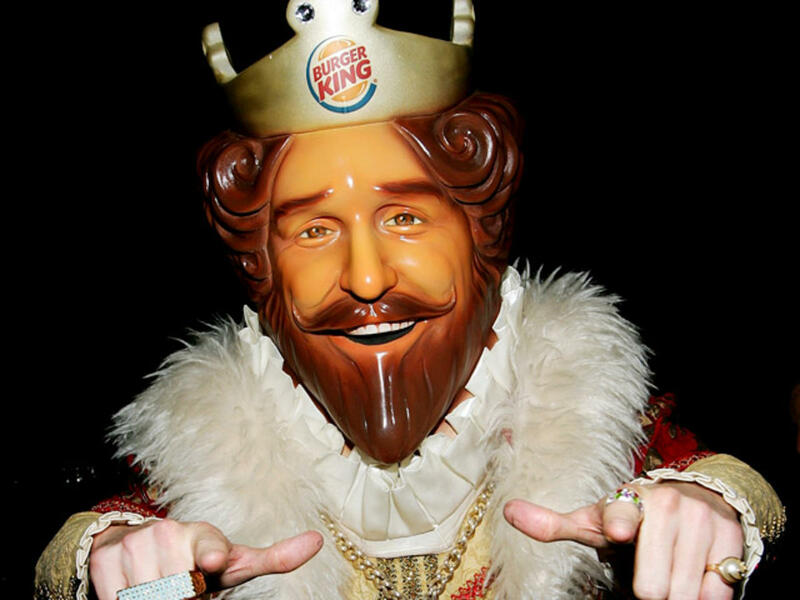 With Adweek reporting The King created over a weeks’ worth of publicity for Burger King simply by appearing in coverage of the ring walk with Floyd Mayweather perhaps this is the first in line for the fast food ambassadors – beware the return of The King, Ronald, and The Colonel. Following the fallout from the recent athletics doping scandal brought to the fore by The Times & German broadcaster ARD last week, this is an opportune time to look at one of the biggest and divisive scandals in sport. The continuing battle between Lance Armstrong and one of his prime sponsors, the US Postal Service. The US Postal Service was a long term sponsor of Lance Armstrong’s cycling team, partnering from 1998 to the 2004 season. The US Postal Service paid $40 million in rights fees across the 6 year term with around $18 million received by Armstrong himself. In the wake of Lance Armstrong’s sensational doping confession in 2013 the US Government are seeking damages of over $100 million under the False Claims Act as it was sold on the notion Armstrong competed as a ‘clean’ rider. In the blog Enter at Your Own Peril, Slingshot Sponsorship previously explored the facets that affect a sponsor when the rights holder is involved in controversy, however the current case has highlighted another valuable point of discussion. The interesting development within the Armstrong vs. U.S.P.S. case is the comment from Armstrong’s legal team that the US Postal Service “got exactly what it bargained for, including tens of millions of dollars’ worth of publicity, exposure to more than 30 million spectators at international cycling events, and hundreds of hours of television coverage”. Herein lies an interesting argument. The US Postal Service did indeed ‘get what it paid for’ with studies stating it received at least $139 million in worldwide brand exposure in four years. Bolstering this, in a document for a 2003 Postal Service news conference the Postal Service described the sponsorship as “may be one of the most effective public relations ventures the Postal Service, and for that matter, any other global service agency, has ever undertaken”. The argument posed by the defending council is during the sponsorship of the team the US Postal Service reached its objective of overhauling the stereotypes of the postal workers, increasing brand exposure and driving sales and that the current revelations had no hand in the effectiveness of that partnership. If the US Postal Service reached its outlined goals it would seem contrived to seek fiscal compensation over a decade after the sponsorship ended. With the battle still rumbling on in the courts only time will tell what the Federal Judge will decide.